Hi, I'm Tyler Falconer. I’ve spent my whole life around dogs from the time I was young & have always had a love for what they can bring to this world. As a result, when I enlisted in the United States Navy in 2010, it was a natural decision to become a Military Working Dog Handler. In my time in the Navy as a K9 handler, I specialized in explosive detection and patrol (aggression) work. Throughout my time in the Navy, I had the great opportunity of working hand-in-hand with police departments across the country and training their dogs along the way. Through this experience, I learned the true capabilities of dogs to the extent where I even trusted them with my own life. Since my time with the military, I have had the opportunity to take the skills I learned during my time there to help dog owners professionally train their companions to be the best they can be! Whether you want your dog to be obedient, protect your home, find someone in need, or learn other amazing things to realize their full potential, I want to be the one to help you every step of the way. I hope to meet you and your canine companion in person soon, and let's get to work! Whether you're a K9 handler or a house pet owner, one thing is consistent - obedience. Unless you enjoy dog sledding, no one likes being pulled around by a dog. No one likes chasing a dog around after he or she may have run away from you either. A poor obedience foundation will lead to major problems for you and your canine. The answer to these common issues is simple: obedience training. The Falco K9 Obedience program begins on-leash and progresses over time to an advanced off-leash level. In order to progress to the advanced off-leash level, handlers must be patient, enthusiastic, and committed to a dog's progress. All obedience levels require practicing at home between each training session. Violence is a common theme in today's society and unfortunately, we see it depicted on the news daily. By participating in Falco K9 Protection Training, you can choose to be proactive in ensuring you and your family's safety. Falco K9 trains a variety of dogs including Military Working Dogs, Police Dogs, and Personal Protection Dogs at all levels. Obedience and control are the most important elements that we focus on during protection training. When properly trained by Falco K9, your protection K9 will spring into action when COMMANDED TO BY THE HANDLER. To schedule protection training, contact Falco K9. Aggression, fear, separation anxiety, environmental issues, and guarding are some of the most commonly seen problems amongst dogs. As dog owners, we often feel we know our dogs best, however when facing these problems, it is important to work with a trained professional. Falco K9 has years of training experience with adopted rescue dogs, many of who have faced adversity in the past. Unconditional love, respect, and patience go into working with rescue dogs. Trust needs to be established in order to mold a desired behavior. Falco K9 applies problem solving and training tactics to your individual dog, depending on your dog's background, current behaviors and future goals. Obedience is learned during each problem solving session as well. Falco K9 also has trained protection dogs for sale, tailored to you and your family's specific needs. Owner/trainer Tyler Falconer lives with each dog and provides the dog with extensive protection training, as well as the necessary family environment and socialization to ensure that the K9 will have a smooth transition to your home, family and lifestyle. If you're interested in learning more, contact Falco K9 or visit the Falco K9 Working Dog page. Your first training class will be held 1:1 with you (the handler), pup, and Tyler. We will discuss your dog’s background, training goals, and cover the general Falco K9 training method. We will then move onto learning the “let’s go” and “heel” commands in order to begin proper on-leash walking. Private at-home sessions are available for an additional travel cost. Contact Tyler directly to coordinate scheduling at-home sessions. Once your dog has mastered the commands covered in the foundational classes, your dog may begin attending the Intermediate/Advanced Group Training. 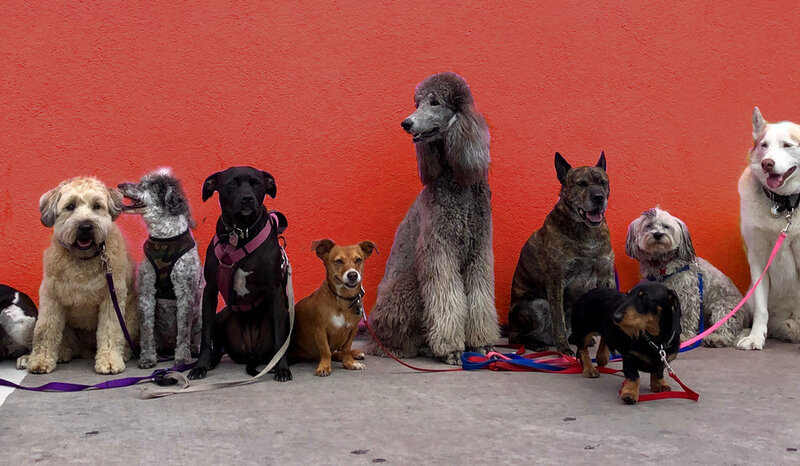 This is a group class (maximum of 10) where we will work on proofing all commands by training through distractions and practicing a variety of advanced problem solving techniques. The Falco K9 Obstacle course is meant to build confidence and trust among you and your dog. There is nothing more fun to watch than seeing your dog’s confidence sky rocket as they overcome these challenging obstacle. The course is built to emulate similar obstacles police and military k9’s go through and not towards sport agility. If you have a small dog? No worries these obstacle are meant to tailor to all dogs. This is a fun way to exercise your dog and have fun with your dog. The puppy program gets the dogs off to a perfect start in their training. During this we cover potty training, socialization, in home management, environmental stability, crate training, and intro to basic obedience commands such as the recall, sit, down, place, etc. This is a fun class for both owners and puppies. The puppy program will have a maximum of 8 dogs per session. This program is designed for dogs 3-5 months of age. Obedience: The Foundation is a basic obedience school. During this school your dog will learn the basic commands on a 6 foot leash. This includes the first class as a one on one session and then 5 group classes . These classes are structured to be very informative and at the pace in which you and your dog are comfortable. This offers proper dog socialization and education about not only having an obedient dog, but to become an upstanding dog owner of Boston. Think what your dog has what it takes to locate a specific target odor? Run your dog through a detection dog program and see if they have what it takes! The odors used are synthetic odor manufactured by a company called Scent Logix. Please note that in going through this program your dog will not be a nationally certified drug detector dog to take down the cartel. This is just a fun activity for you and your dog. $45 PER DAY, INCLUDING AT-HOME MORNING PICKUP AND EVENING DROP-OFF. Falco K9 is excited to announce our brand new South Boston board & train facility. Starting in April, our team will be offering a comprehensive day school program that includes doggie at-home pick-up and drop-off. School consists of work (obedience training), play (supervised socialization with other dogs) and rest. Phase 1 is 14 days of boarding and training with Falco K9. Phase 1 is an ON LEASH PROGRAM. This is our foundational obedience program. All commands are taught on leash. The command taught are lets go, heel, sit, down, stay, come, and place. We also work on no jumping and controlled entry though doors, socialization, and exposure. Please note that this is a foundational program and done on leash. With proper maintenance the lessons learned in phase one should last a lifetime. Financing options available. Puppy Imprinting Program teaches the puppy the concept of obedience by introducing the spoken commands that will be used for the rest of the puppies life. The commands introduced are lets go, heel, sit, stay, place, and come. This program is available for puppies 12-15 weeks of age. Exercise is a necessity for maintaining optimal physical and mental well-being in your dog. Falco K9 offers daily hikes for past and present training clients. Your dog will be picked up at home by a Falco K9 team member, and driven to the Middlesex Fells Reservation for a 60 minute hiking adventure. Each trip is with a maximum of 3 dogs. Dogs must be approved for Phase 2. This is a remote collar based program. Owners are expected to pay in addition the cost of the brand new remote collar to take home (approximately $260). Financing options available. Interested in signing your dog up for a board & train program? Contact Falco K9 and lets talk! A Working Dog is a dog that possess the genetic potential to do extraordinary things. A Working Dog is trained to keep military, police, and civilian handlers safe. The dog's tasks include a wide variety of things ranging from suspect apprehension, narcotic and explosive detection, locating missing persons, and threat elimination. A well rounded working dog is social, environmentally sound, and ready to answer the call. If you're interested in purchasing or training a Working Dog, visit Falco K9 Working Dogs to learn more. Let's talk about what you are looking to gain from Falco K9 training and I will deliver a program that is best suited for you, your K9 companion and your lifestyle. Thank you! Falco K9 will respond to your message shortly.